UK Ambassador to Vietnam Giles Lever said fighting wildlife trafficking is becoming increasingly important for both the UK and Vietnam. To protect wild animals and eradicate illegal wildlife products, stronger political commitment is crucial, as is improving the law enforcement’s capacity and promoting community awareness, he emphasised. He added Vietnam plays an important role and its cooperation with the UK can help determine solutions and implement them. 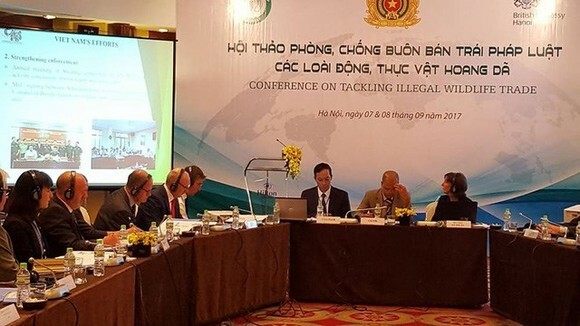 Col. Nguyen Van Chieu, Deputy Director of the external relations department of the Ministry of Public Security, said Vietnam pays attention to protecting biodiversity and wild animals, especially endangered ones. It has joined many international conventions, set up specialised forces such as environmental police, and signed cooperation agreements with customs forces in this field. He noted on September 6, customs officers at the Saigon Port Border Gate and anti-smuggling police seized more than 1.34 tonnes of elephant ivory. At the two-day conference, participants looked into challenges in the fight against the illegal wildlife trade. Representatives of the UK Border Force, British Airways and Heathrow Airport shared experience in coordinating law enforcement units, airport management agencies and airlines, personnel training, the role of local administrations, and caring for seized wild animals.